A good storage ware set for a variety of jobs! 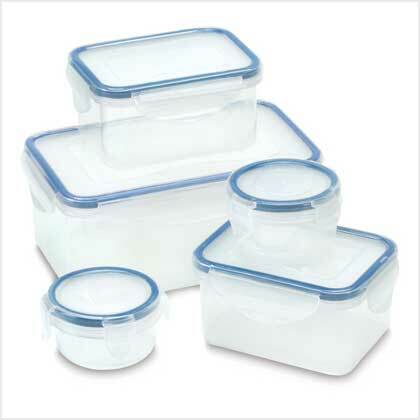 Organize your kitchen for recipe ingredients, leftovers, or odds and ends with this nice set of long term Plastic 10-Piece Assorted Storage Container Set. Clear plastic material Allows you to see what is inside the boxes. Quick snap lids Are easy to close ad help contents remain fresh. Assorted sizes Permit storage of various quantities without wasting container space.